Can I buy shares in the Raspberry Pi Foundation? We’re a charity, so you can’t buy shares in the company. If you want to support us, we’d love you to buy one. You can buy the Raspberry Pi through Premier Farnell/Element 14 and RS Components. Both distributors sell all over the world. How many can I buy in one go? We’ve lifted the one-per-person restriction: you can buy as many as you want. The Model A will cost $25 and the Model B $35, plus local taxes and shipping/handling fees. What will I get when I buy one? You will get the Raspberry Pi Board itself. A power supply or SD cards are not included but can be purchased at the same time from Farnell and RS. You will be able to buy preloaded SD cards too. The setup described here is the simplest one, using just the USB ports on the board and a television or digital monitor. If you’re a total beginner, please visit the beginners’ section of our forums, where there are photos of what all the cables you’ll need look like, and more hints and tips to get you started – our community’s very friendly, and if you dive in, someone there will be happy to help you with any questions or problems you might have. Prepared SD card (see below). HDMI or composite television, OR a monitor with DVI or HDMI input, and an HDMI/composite cable. Micro USB power supply – make sure you use a good quality one, capable of providing at least 700mA at 5V. Do not attempt to power your Raspberry Pi by plugging it into a computer or a hub. You will need an SD card with an operating system preloaded before you can boot the Raspberry Pi. A brand-name (not generic) Class 4 card of 4GB or more is recommended. To obtain an SD card image, and for instructions on how to flash an SD card from a Linux or Windows PC, please refer to http://www.raspberrypi.org/downloads. We recommend that developers use the Raspian “wheezy” image, which includes Python, gcc, and a range of example applications. Digital audio is available via the HDMI connector. Analogue stereo audiois available from the 3.5mm jack. 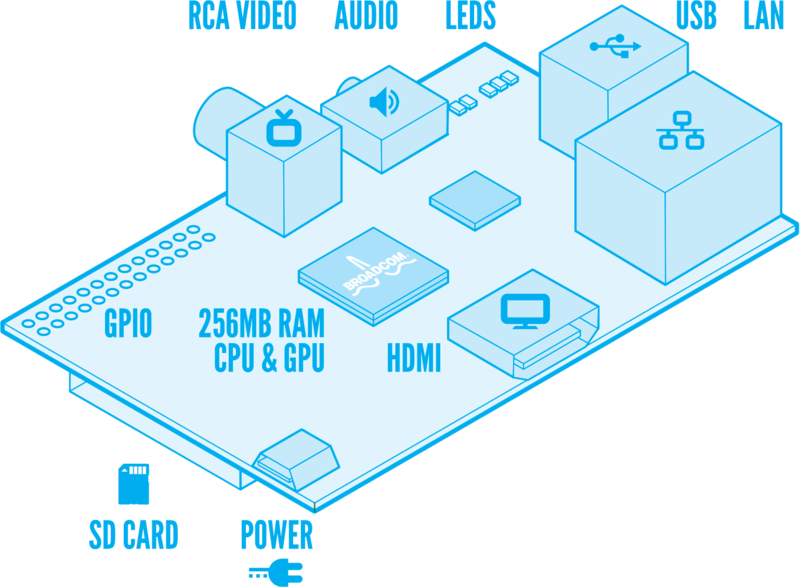 To boot the Raspberry Pi, connect the monitor, mouse and keyboard, insert the preloaded SD card and plug in the power. If you have inserted the Ethernet cable, the device will attempt to acquire a DHCP lease at startup. You can login with the username and password on the downloads page. For superuser privileges, “sudo” does not require a password. Once you are logged in, you can start the X window system using the “startx” command. New SD card images are released regularly at http://www.raspberrypi.org/downloads. Major areas of on-going optimisation include offloading the X window system to the GPU, which will speed it up considerably. None of the browsers for Raspbian “wheezy” support HTML5, and there is currently no Flash support, so unfortunately you cannot watch YouTube videos; we’re investigating HTML5 solutions. (If you’re desperate to watch YouTube, you’ll need to put XBMC, Raspbmc or OpenELEC on an SD card – visit our forums to learn more.) There is currently no Java Virtual Machine (JVM) included in the default file system; we will address this in a future release.